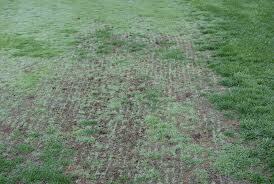 Power or slit seeding is an effective process to rejuvenate a thin lawn, and improve density. How does the rejuvenator process work? The seeding machine is operated over the area to be seeded. The blades rotate, cutting vertical rows to open the soil. While this is happening the machine is inserting the seed directly into the newly sliced soil. To ensure the best possible germination, we go over the area a second time at a 45 degree angle to the previous pass. 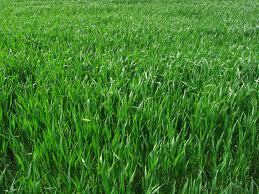 This creates a checker board effect leading to the thicker, stronger crop of turf. After seeding the lawn in a few directions there may be some debris to remove. The seeding machine removes thatch, semi decomposed grass, and other organic material that accumulates in the lawn over time. We rake these materials up and relocate them on the property or haul it away. Once the lawn has been cleaned we apply a starter fertilizer. In order for the seed to germinate, the soil needs to be moist and the soil temperature must stay in a range of about 55 degrees. Germination times vary with different grass cultivars. Most seed will start to grow within in 5 to 21 days. When the grass is a couple inches tall it is time to cut back on watering. Watering should be reduced to once every 2 or 3 days depending on the climate. Once your lawn is at cutting height you should water deeply but not as often, water to a depth of about 3 to 4 inches. Finally, don’t water again until the lawn starts to show signs of stress. This procedure trains the grass plant to grow deeper into the soil allowing it to reach available water and nutrients.